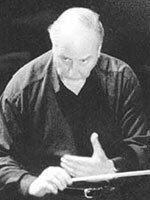 Former Conductor, London Wind Orchestra (United Kingdom) Geoffrey Brand – one of the leaders of the modern band movement in England; conductor for numerous high quality concert band recordings by the top professional musicians in London. A popular lecturer and guest conductor in the U.S.
Born into a Salvation Army family in Gloucester, Mr. Brand made his career as a professional trumpet player with the Royal Philharmonic, Philharmonia and Covent Garden orchestras. He worked closely with brass and military bands as a BBC Producer (1955 – 68) before turning with great success to conducting and publishing. He rose to prominence in brass banding after a successful spell as a professional conductor of the Black Dyke Mills Band. He assumed leadership of the band in 1967 and led the band to a win at the Nationals in his first year. Brand took the Black Dyke through its most successful period for some time by also winning the British Open Championship in 1968, taking 2nd prizes in the Nationals in both 1968 and 1969. In 1970, the World Championship was theirs, and in 1972 he followed with the ” rare ‘double’ of winning both the Open and the Nationals in the same year. Geoffrey Brand has conducted the BBC both in the United States and in England. In addition to his orchestra career, he has produced numerous radio programs with the BBC, been editors of The British Bandsman, authored books on brass bands (“Brass Bands In The 20th Century”), been a music educator, recording artist, and a guest conductor/clinician in all parts of the world. In addition to his above referenced success with the Black Dyke Band, he has also conducted winning performances at The National Brass Band Championships and British Open with the Grimethorpe Colliery, and Brikhouse and Rastrick. He has led both the National Youth Brass Band of Great Britain and The National Youth Brass Band of Scotland. Geoffrey is the founder, artistic director, and conductor of the The City of London Wind Ensemble. He is recipient of the International Award from The Midwest Clinic in Chicago.